Another weekend is coming to a close. Which means another week of my maternity leave has slipped by. And that ultimately means that Elliott is another week older. He is 7 weeks old today, and he is growing so quickly *Sniffle*! It is a double edged sword. I get excited every day they he makes a new noise or facial gesture, and yet I know that it means that we are one day older than the day before. *sigh* His hair is turning strawberry blond, and he has the cutest orangy colored eyebrows. He has started to make like squeak sounds, and is cooing. He loves to take baths, and hates to have his clothes changed. We have our 2 month check-up on Tuesday, which we aren’t looking forward to. We went to our first of many baseball game on Friday night as a family. 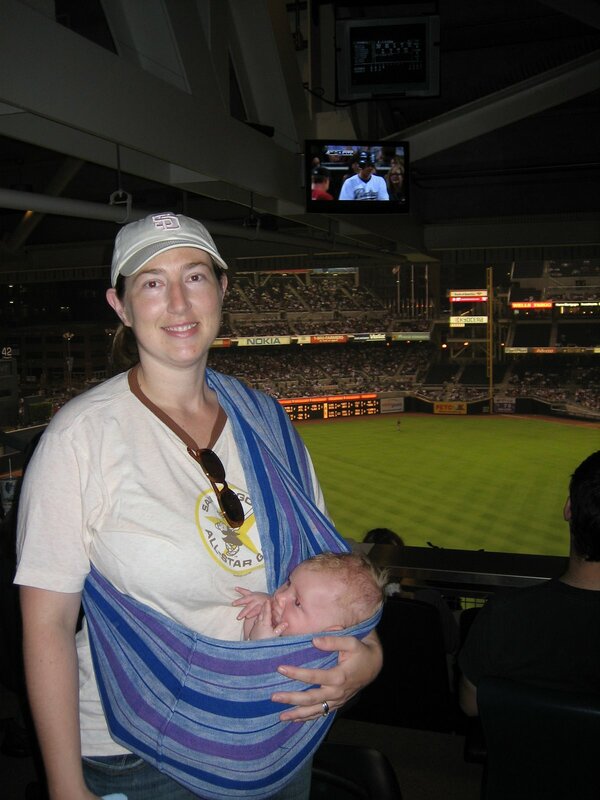 Elliott was decked out in Padre gear, and slept through the entire game in the sling. What a rock star.